Wakefield Trinity head coach Chris Chester has hailed his team's progress in the past 12 months. PIC: Tony Johnson. Wakefield Trinity are in a much stronger position compared to this time last year, according to head coach Chris Chester. Trinity begin their 2019 Super League season in the capital with a clash against newly-promoted London Broncos on Sunday (3pm). Danny Brough is one of the new arrivals at Wakefield Trinity this season. PIC: Bruce Rollinson. Wakefield’s recruitment during the off-season has added more balance to the side with Danny Brough, Craig Kopczak, George King and Ben Reynolds arriving at the Mobile Rocket Stadium. And although Chester admits that he is wary of the threats that London can pose, he insists he is confident that his side will pick up the two points on Sunday. “I’m always confident, I feel we are in a better spot than we were this time 12 months ago,” said Chester. “We look to have a more balanced squad, we have got some exciting players and still have a big pack that is also very mobile. 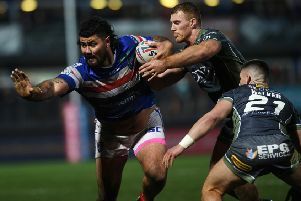 Pauli Pauli is Wakefield's only injury concern heading into the start of the new Super League season. PIC: Tony Johnson. London play their home games on a 4G surface, something that Chester has been preparing his side for in training this week. Trinity have held training sessions on the artificial surface beside the Tetley’s Stadium, the home of Championship side Dewsbury Rams. Chester insists that the Broncos have Wakefield’s respect after only conceding one try in their last three outings. “We are playing on a 4G pitch which will be challenging in itself,” admitted Chester. “We have had a couple of sessions on the surface at Dewsbury this week. “It is the second year we have played the promoted side from the Championship. “Last year we went to Hull KR and that was a tough game and this time we are expecting another tough challenge against London. “Looking at the last three games they have had, Leigh, Doncaster and the Million Pound Game against Toronto, they have only conceded one try. “So they have got our respect, we have trained pretty well and for us it is more about attitude. Wakefield’s focus is firmly on London this week but Chester has made no secret that his side are targeting a place in the top five come the end of the season. “We want to be involved in the play-offs and in those kind of big games,” added Chester. “But for us to do that, we have got to be a lot more consistent that we were last season. The Wakefield boss has almost a full squad of players to choose from for their Super League opener this weekend. The only player not available is prop forward Pauli Pauli, who is sidelined by injury. Chester confirmed: “The only concern is Pauli but his rehab is going really well. “Apart from that we have a full squad to choose from, it is a nice position to be in. “There are obviously going to be a few disappointed people that won’t be playing. “But it is a long season and every player will get an opportunity at some point. “The squad I have picked is a reward for performances in training and over the last couple of weeks in the pre-season games.